The Writer Chic: Is it just me, or is this in poor taste? Is it me, or is the Homer Simpson stamp a little inappropriate? I mean, really? Homer Simpson? As my dear Kendra said when I told her, "don't these places pay people to think about this sort of thing?" Seriously. Turn your dang brain on, folks! Sure, this everyday stuff to *them*...but not to the people they're sending the certificates out to. They have plain stamps out there! *smacks more people*. GEESH! Love you, Mon! Yup, way out of line...That is awful. They deserve a phone call on that one! Sorry! I agree. Poor taste. Maybe you should send an email and let them know. goodness. let's hope it was the work of some immature summer intern. because that's just bad. I am in shock here. 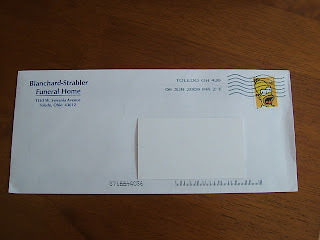 I cannot believe any professional company would use a Homer Simpson stamp on their business mailings. That is in the poorest taste imaginable. I would definitely be sending them an email or calling them or something. I'm so sorry you have to deal with things like that, Mon. That is the same funeral home that cremated baby Grace. Although, it took me awhile to go pick up the ashes, and I believe the cremation certificate was with her when we got her back, so fortunately, I did not get a Homer Simpson stamp. Oh my goodness....I am appalled by that. Seriously??? I can't believe the poor taste. That is the most ridiculous thing I have ever seen. Unprofessional doesn't even begin to describe it. I would absolutely call and let them know that a Homer Simpson stamp is not OK in their line of work. OMG -- you've GOT to be kidding me?! Definitely poor taste -- sheesh! Wow! Lack of professionalism! I would call or right a letter. Make sure you send the pic too. Hopefully they will take care of the matter and at least apologize. I took the flags, of course! Their mommas did not raise them right, that is for sure. Absolute poor taste. & at the same time...curious to know what exactly was going on in the sender's brain at that moment? I work in marketing for a retirement community & one year for Christmas, a funeral home sent me a bottle of wine & a card that said "Thanks for all you do! Merry Christmas!" ummm.....you're welcome? ::shakes head:: Sometimes I think the folks at funeral homes are like the kids that push violently against a door when it says "PULL" in bold letters.